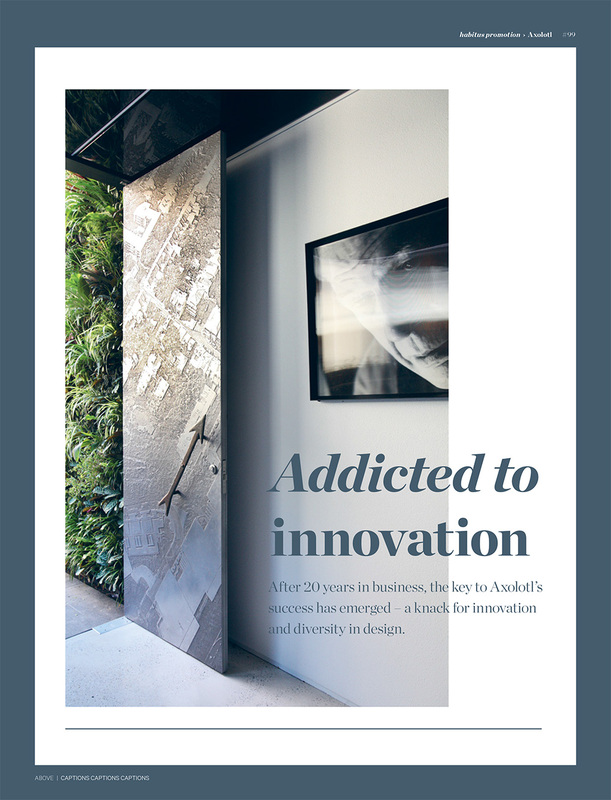 After 20 years in business, the key to Axolotl’s success has emerged – a knack for innovation and diversity in design. When brothers Kris and Kim Torma launched a metal finishes business from a one-car garage space in Redfern in 1995, they probably didn’t envision an art project, a bed & breakfast and a furniture brand – in addition to their core product - 20 years down the track. Starting out with just four metal samples, Axolotl now offer hundreds of finishes, including glass, concrete, sheet metals, timber and terracotta, as well as metal inlays into glass. The willingness to adventure into unchartered design waters is not just a business strategy, but also a personal interest, making their ‘job’ more of a lifelong education. “Learning and exploring new materials and processes is what interests us. We have fun experimenting and developing our products – each piece and project is unique, and the sum of this is presented in our vast product range today,” he says. The product lends itself to an array of applications – from facades and doors to furniture, finishes, flooring, cabinetry and sculpture. The initial design process involved cold applying metal to other elements: now this is just one of the many processes the company has developed – and won coveted product innovation awards with. And if the product development was not enough, Kris and Kim also expanded laterally, introducing the Axolotl House, a mud brick adobe residence in the Hunter Valley, which operates as a B&B. Handmade by Kim. “The environmental design, and the beautiful spaces built reflect both our personal and professional interests and values,” says Kris. “It was opened to the public to invite people of like minds to appreciate the spaces and scenery.” As well as this venture, the brothers have also launched Anomaly, named because each piece in the range is hand-crafted which by its very nature means there are anomalies. “We see this as a positive thing that shows the product is unique and isn’t mass produced.” Kris explains, whilst also being a fully Australian furniture brand designed and manufactured locally. The diverse branches of the business reflect an adventurous spirit, and if, as Steven Hawking said, “Intelligence is the ability to adapt to change.” Axolotl’s IQ is off the charts.